Not only do MP4 players like the CVSJ-1316-8GB make great e-book readers you can get books for them for free. It’s funny that the written word has flourished in this digital age, despite the ongoing plight of newspapers and radio stations. Sales for trade ebooks were worth $14 million for June in the US alone, 132% more than what sales were last year according to the Association of American Publishers. It appears authors are likely to have a long and healthy future, even though the world is heading more and more towards digital media. However, you can read ebooks on more than just dedicated devices like the Kindle and Daily Edition, in fact these are just some of the devices available from Chinavasion that have an ebook function. With so many devices that handle the ebook there’s no surprise that Amazon has done as well as it has, and selling ebooks has become something of a big business for many people. 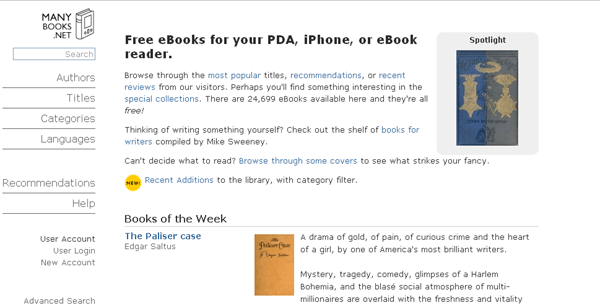 Thankfully there are also a lot of places you can get ebooks for free. Without further ado here are some locations to download free content to keep you entertained when you’re commuting or stuck with an electronic device and have nothing better to do than to read. According to the site’s creators the name Project Gutenberg was used to honor the inventor of the Gutenberg printing press. The first printing press with movable type which made books more affordable and available to the masses. Like the Gutenberg printing press Project Gutenberg was also the first site of its type to offer free ebooks, and is one of the most accessible sites to use. 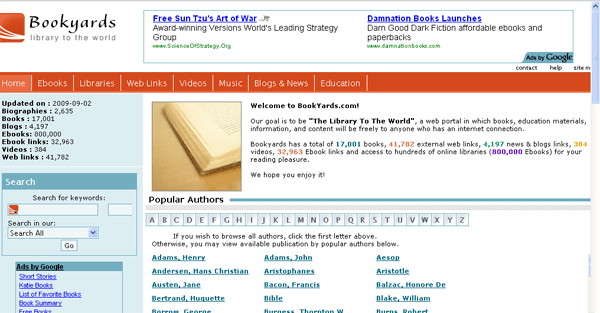 While they do ask for a donation for books they will let you download all of its public domain books for free. That doesn’t mean that the books aren’t good. After all this includes works by William Shakespeare, Charles Dickens and Edgar Allan Poe. It’s hard to talk about web 2.0 without talking about Scribd. Calling themselves ‘the YouTube of document sites’ Scribd has become a very popular place for writers and fans of the written word to download and upload material. You can usually find a very wide selection of materials on Scribd with everything from eBooks, to lectures, to articles, to magazines, to pictures and comics to sheet music being on offer. They even let you download in a range of formats. If you find something you are interested in you can download it in a txt pdf or microsoft office document format. If you’re a fan of science fiction or fantasy then this might be a great resource for you. The service was set up by science fiction writer, Eric Flint and science fiction author and publishing house Baen Books owner, Jim Baen. This site offers up to 112 books by authors of Baen Books to the public for free. It also has a paid subscription-based ebook program. However, if you’re after more of a range of fiction then Many Books might be a better place to go. With, what they say are 30,000 titles to choose from, most being in the fiction category of things, there should be something there to keep you entertained for a few days. 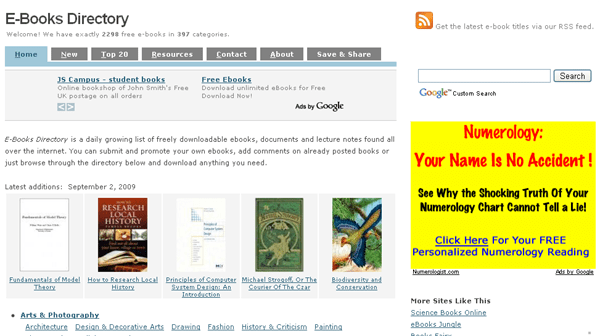 Bookyards is a little like many books in that it is mainly focused on works of fiction. However, the big difference between the two sites is that it is more organized by author than many books, with the most popular authors being listed on the front page of the website. 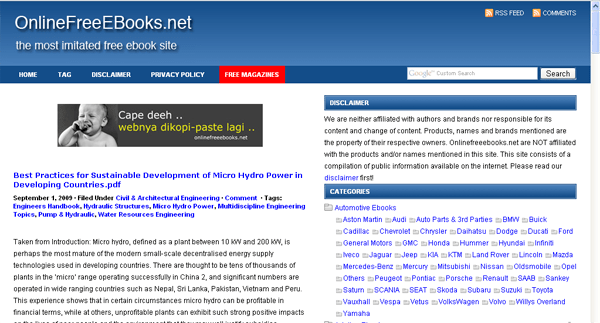 This site also claims to have access to other information sources as well. While it might be a highly optimized title, and the description line “the most imitated free ebook site” might fall into the category of hyperbole this is an excellent reference point for anybody more interested in reference and non-fiction books. There’s something in almost any category, from Agricultural engineering to human resources and marshal arts. The biggest section seems to be car manuals. This is an ebook directory that, while only having a little under 3000 titles, has gone for quality over quantity, making a wide range of interesting titles in a number of different fields available. So there you have it. Go to these sites, start collecting interesting titles, and if you don’t already have a reader, check out the wide range of ebook capable devices at Chinavasion today. And if there’s a great ebook resource that we’ve missed and you think we should share it include it in the comments below and we’ll add it to our blog.